At MSPO 2014 International Defence Industry Exhibition, Krauss-Maffei Wegmann unveiled for the first time a new air-transportable light armoured vehicle designed for special forces operations. 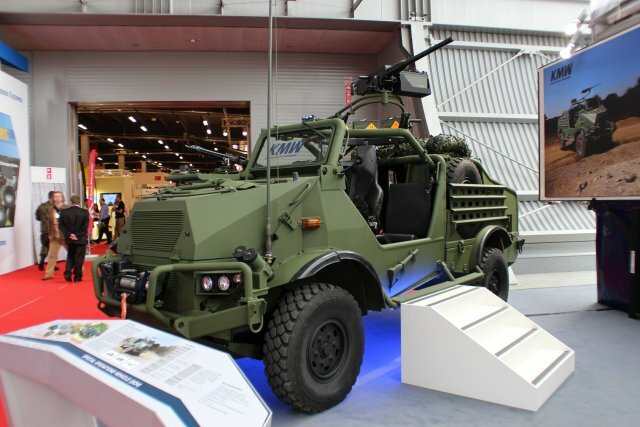 The KMW Special Operation Vehicle (SOV) should be the first of a family of products based on the Bremach chassis. Krauss-Maffei Wegmann showed interest in the Bremach chassis in the mid-2000s, as German Special Forces had a requirement for a compact, CH-47-airliftable long-range patrol vehicle. In 2008-09 the Italian company carried out an 11-month test and qualification phase at the WTD 41 proving ground in Meppen, during which the vehicle covered over 10,000 km and demonstrated its capacity to cope with 100% slopes and 58% side slopes, 900 mm fords without preparation and turn in less than 13 metres. Bremach engineers have since worked closely with KMW designers, and the result is now showcased at MSPO 2014. An open top vehicle, capable to be quickly reconfigured according to the mission, it will be capable to fit inside the principal transport helicopters. The KMW special operations vehicle based on the Bremach chassis should be the first of a family of vehicles based on that particular chassis. KMW’s Special Operation Vehicle is a new modular system for Special Forces. Air-transportable, the SOV is feated for long-range reconnaissance and special operations. Thanks to the innovative folding roll-bar cuts, the preparation time for internal transport in CH47/53 helicopters downs to under 2 minutes. With its IVECO 3.0 liter diesel engine (125kW, 400Nm), its heavy-duty chassis and a well-balanced power-to-weight ratio, the SOV combines outstanding mobility with maximum off-road performance, great operation range (900km) and extreme combat power. The chassis provides ballistic protection and a mine protected underside. KMW’s SOV allows a high firepower level with three different gun mounts, permitting the use of a 12.7mm MG or 40 mm GMW, a 5.56/7.62 mm MG on pedestal mount (commander), a second 5.56/7.62 mm MG on pedestal (rear gunner) and a Wegmann 76/40 mm multi-purpose launcher.